The consumer electronics industry has always fascinated me. I spent my first ten years as an analyst covering the telecom industry, which historically has had very good margins. 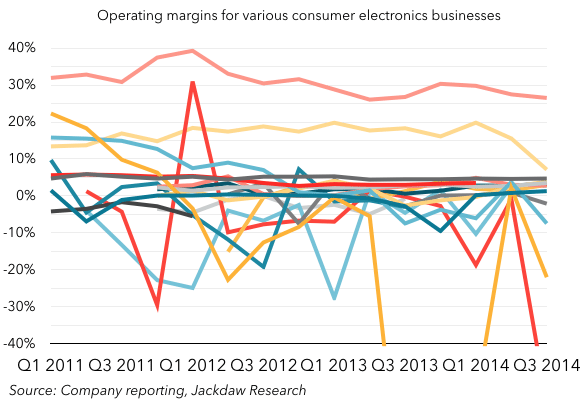 But, when I started covering the consumer electronics industry, I was struck by the fact the vast majority of players in that market make razor-thin margins, if they’re profitable at all. Even more striking is Apple, which might be described accurately, if incompletely, as a player in the consumer electronics market, makes telecom-like margins while competing with those barely profitable vendors. And just as interesting is the fact that, as players that have historically only competed indirectly in the consumer electronics business enter it, at least some of them are choosing to follow Apple’s route to the high end of the market. As I mentioned, Apple is the one exception to all of this, with between 25% and 30% operating margins during the latter half of this chart, while everyone else scrambles at 5% or lower margins. How does Apple achieve this distinction? Well, it’s due to a combination of factors but it’s probably best summarized this way: Apple provides premium products at a premium price, and is able to justify the premium through differentiation based on a tightly integrated approach to hardware and software. So far, we’ve largely focused on those vendors who make the bulk of their revenue from selling consumer electronics hardware. But there are three relatively new players in this business who have traditionally participated only indirectly in this competition and who are entering the computing hardware market (in its broadest sense) in new and interesting ways. Google and Microsoft have traditionally participated mostly by providing operating systems to hardware vendors, while Amazon has participated largely as a seller of other people’s hardware. Each of their strategies is unique and different but, with two of them, there’s an emphasis on the high end which I find interesting. Look at Microsoft’s most recent hardware event: it announced the Surface Pro 4, a Windows tablet which starts at $899, and the Surface Book, a Windows laptop which starts at $1499. Both of those price points are well above the average prices in their respective categories and very much represent premium products. These (along with older versions of the Surface line) are essentially the only computing hardware products Microsoft sells, and they’re very much premium merchandise. In fact, the Surface Book starts at a higher price than the vast majority of Windows laptops on sale today and almost all the products announced by OEMs during the same period had lower prices. Microsoft is very much pursuing the same “premium product at a premium price” strategy as Apple and attempting to provide the same levels of optimization and integration as well (with mixed success). Arguably at the opposite end of the scale here is Amazon, which has moved increasingly down-market with its tablet strategy. One of the reasons people were so surprised by the pricing of the Fire Phone was it seemed to fly in the face of the clear strategy Amazon had laid out with its tablet line: decent hardware at prices that undercut the competition. Since the Fire Phone launched, Amazon has lowered the prices for its low-end tablets even further and it’s increasingly clear this is the main focus of Amazon’s hardware strategy today. Yes, it has some “premium” devices too, but even these tend to sell at prices that fall much more into the mid-tier rather than the high end. I’m still unconvinced as to whether this is a good idea, as I’ve explained elsewhere, but there it is. We come now to Google, who also had a hardware launch event this past fall and where its strategy was on display. Google’s approach has arguably been something of a mix of Microsoft’s and Amazon’s. Attacking the low end with devices like the Chromecast but also moving increasingly upmarket in the smartphone and tablet categories. There was no new Chromebook at this event but the only one Google has sold under its own brand so far is the Pixel, which retails at $1000, well above any other Chromebook. In smartphones, the Nexus line is an odd mix of Google branding and OEM manufacturing but even that line has been moving steadily up-market, while taking something of a cue from Amazon’s higher-end tablets, with premium hardware at discounted prices. But the product that perhaps signifies Google’s pursuit of the high end best is the Pixel C tablet, with high-spec and well-designed hardware, but at a starting price of $500, with an optional keyboard for another $150. In a world of cheap Android tablets, the Pixel C is as unrepresentative as the Surface Book is of Windows laptops. Even though Google continues to pursue a low-end strategy with some of its own hardware, it’s increasingly clear that both OS vendors turned hardware vendors have decided to embrace the high end along with its high margins, while leaving the scale and the thin margins to their OEMs. Meanwhile, their OEMs continue to struggle to make the business work, with several exiting segments of the market entirely and several others clearly having a hard time staying afloat. Sony has abandoned PCs and continues to struggle in smartphones, HTC increasingly looks like it’s on its last legs as an Android vendor, Toshiba is considering spinning off its PC business, and Samsung’s smartphone business – once the poster child for success making Android phones – continues to slip. It sometimes seems as if the only vendors making Android phones and Windows PCs who aren’t struggling in some way are the licensors of the operating systems. And though we don’t have detailed financials for either company’s hardware business, they’ve both done it by focusing on selling premium devices at premium prices, and by tightening the integration between hardware and software. What’s interesting is we haven’t seen any of the OEMs pursue this strategy. That likely reflects, in equal parts, a lack of capability and a lack of will, as these OEMs have neither the experience nor the desire to pursue the high end of the market. And yet it’s been clear for years that, while scale may be in the mass market, the margins are in the high end. These OEMs’ continued focus on the low end and mid-tier of the market, combined with their licensors’ focus on the high end, is likely to make life increasingly difficult as saturation and even decline begins to set in within the markets they serve.